Many companies like to talk about their 'Digital Marketing' strategy. But does anyone really think that one way communication demonstrates understanding of customers' needs and wishes? The innogy Innovation Hub is building a radically new kind of customer experience based on Object Marketing and the use of 'Digital Twins'. A Digital Twin is a digital model of a real life process, product or service with a unique, immutable identity. Digital Twins are bridging the gap between the physical and digital worlds. The data gathered by Digital Twins helps companies better understand customer interactions and needs, enabling a more focused development of products and services, while at the same time driving business innovation. A 'Digital Twin' can be a digital representation of a physical product. By inserting e.g. a smart tag or a crypto chip, manufacturers can create an independent unit with its own unique identity. In the new world of "industry 4.0", digital twins are already used to guide the manufacturing process by providing batch size 1 manufacturing, back to birth-traceability, provenance, authenticity, process optimization, and auditing. But imagine a future where every object has its unique ID on a decentralized platform (blockchain) with its own crypto wallet? We build a native app using this service allowing you simply use your smartphone to interact with your beloved handbag or surfboard – just proof ownership, document your personal product's story and many more. On the other hand, the manufacturer can provide relevant contextual information to you, learn from your experiences, provide product related services and also reward you as a user – completely privacy protected. It provides the manufacturer with a direct communication and marketing channel with its users, instead of relying upon intermediaries e.g. advertising platforms or retailers. It is highly data privacy friendly and GDPR1 compliant, because the personal data remains on the users’ phone and is not shared with the manufacturer. In the innogy Innovation Hub, we believe that 'Digital Marketing' is at a tipping point: fraudulent ads, paid recommendations, fake friends and likes together represent the tip of the iceberg. Users increasingly demand meaningful interaction with products, while mainstream marketing activities remain focused on owning and consuming products. 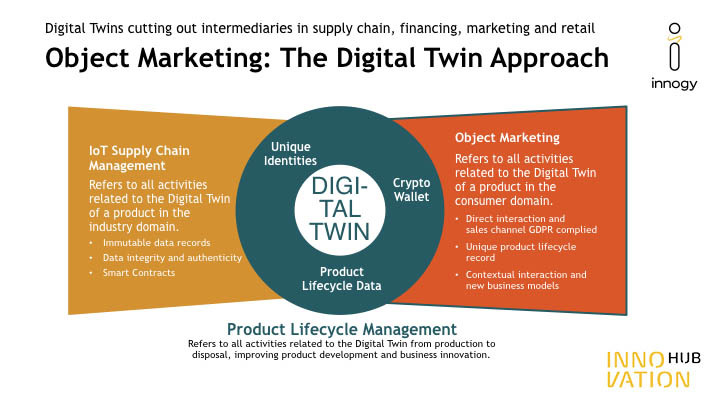 'Digital Twins' and 'Object Marketing' can help to bridge this gap with new streams of transferred value between manufacturers and customers.